The book of Proverbs is one of the wisdom books in Jewish and Christian history. Bible readers love this book of compact instruction. Yet many people do not read these Proverbs collected by Solomon and others. This little book is a guide to reading the Book of Proverbs. An excellent journey through Proverbs. I appreciated the "How to Study the Bible" section. My takeaway from the book is that we need to see ourselves as God sees us. Kevin Gisi did a great job narrating. I was gifted this audio book with the understanding that I would leave an honest review. A Fool's Journey Through Proverbs is not your normal bible study guide. This journey is filled with the author's life experiences. I found much of what Carole writes as having been true for me too, I love that she says to choose a bible that speaks to you and that you understand. I have said this to so many but I have been too far to many churches that preach that only one version is the truth. So said that man feels he knows more than God. Kevin Gisi narrates this book and does a good job. This is a unique and inspiring guide into the Book of Proverbs. Carole does such a beautiful job of exploring this Book, relating her own life experiences to draw us into the Bible and its teachings. Bravo for a job well done, I would recommend this to anyone who loves the Bible and would love to hear more about Proverbs. It's an excellent listen, and I am fortunate to have found this one. Carole is a great and thoughtful author, and I enjoyed the narration as well. 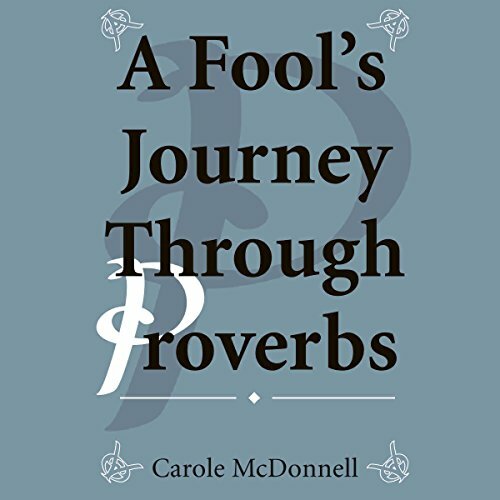 Carole McDonnell takes readers on a journey through the wisdom of the Proverbs. I appreciated how McDonnell approached the text from the perspective of a fool, seeking wisdom from past mistakes (while trying to avoid future pitfalls). I also appreciated how personal the author was in the text. This intimacy really helped bring some of the Proverbs to life. Finally, this book caused me to pause a number of times, because it challenged my thinking, which is ultimately an excellent gift. Highly recommended! This was an interesting and thought-provoking exploration of the Book of Proverbs, with lots of great insights and suggestions. In addition to her analysis of the proverbs, I appreciated the author’s reflections on life, the Church and what she thinks it means to be a good Christian. She gives great tips for choosing the right version of the Bible to read and the right church to attend, for example. My favorite part of this book, though, was the chapter near the end titled “Basics in Bible Study.” Here, the author provides a fascinating overview of the Bible: the name of each book, who wrote each book, the summary of each book, how the Bible is organized, etc. She also shares historical details on the Bible that are quite fascinating. For me, this chapter was the most informative and interesting part of the audiobook! The narrator does a good job narrating-he has a pleasant voice and was easy to follow.